Happy Saturday! I’m just about to head to the gym for a 60 min swim + 45 min run + stretch/core. Woot! Tomorrow is my rest day. Words cannot express how giddy I am. Another thing that makes me equally as giddy? 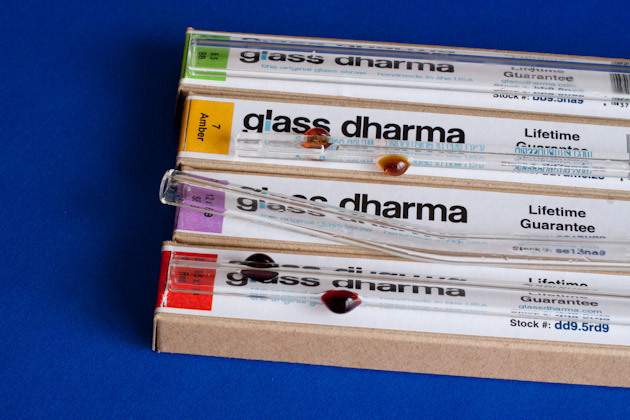 glass dharma straws. Extra long 9.5mm x 10″. They say it’s the perfect straw for mojitos so when the opportunity arises I know what straw to grab. In the meantime though I did enjoy this straw in my mineral water + juice concoction last night. “Decorative Dots” amber straw that’s 7mm x 6.25″. I’ve loved using this one with the small glass of chocolate almond milk I drink while Kevin and I watch movies. Bendy straw! [aka “Beautiful Bends”] it’s 12mm x 9 ” in size and is my favorite out of all of them. I was the kid that went bonkers for the bendy straws at birthday parties so this is quite the treat. “Decorative Dots” red straw that’s 9.5mm x 9 “. It’s a perfect size. I cannot believe there are 2 sizes up from this one. It’s just right for my morning smoothies and is just so darn beautiful! Lifetime guarantee. If your straw breaks, glass dharma will replace it for free! Even for a klutz like me! Easy to clean. At an additional cost, each straw can come with a matching brush. Hypothetically if I were to leave my smoothie cup on my desk all day and night and day again… the straw would still be easy to clean! Hot and cold drinks. Have you ever wanted to drink your tea out of a straw? I did on Wednesday, and it was awesome. Plastic free. The less plastic in our lives the better, especially when it comes to the plastics around our food. Good to the environment.We [used to] go through so many disposable straws with our somewhat daily coconut dessert smoothies [Kevin refuses to drink smoothies without straws]. We’ve completely slashed our impact on the environment. Every little bit counts! What’s better than eating a muffin? DRINKING a muffin! All measuring and preparation is done the night before you enjoy this delectable breakfast so you can still start your day off right and get to sleep in for a couple of minutes. 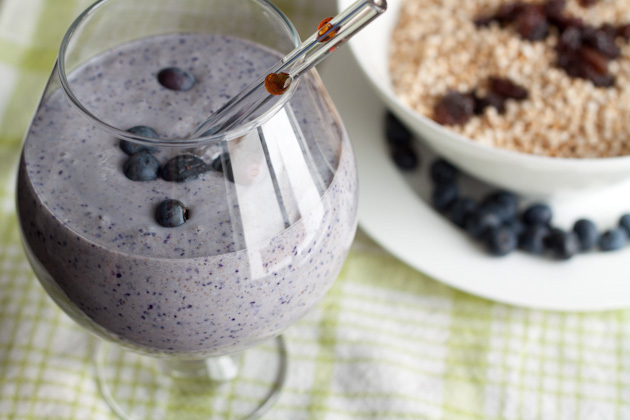 Night before: combine all ingredients [but the blueberries] in a glass or plastic container. Stir to combine and place in fridge. 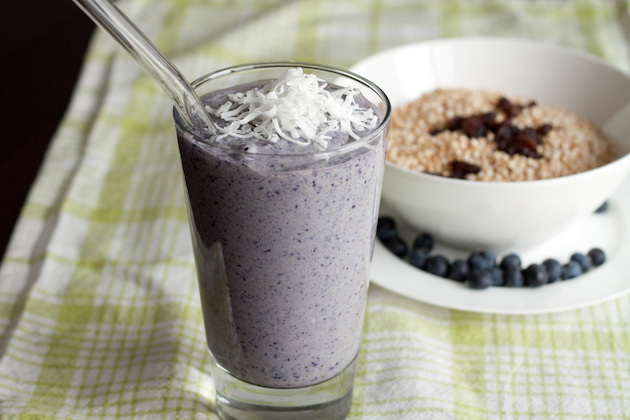 Morning: pour contents of container into blender, add blueberries and blend until smooth. View Nutritional Information (once on page scroll down) Nutrition stats: calories 282; fat 11g; carbohydrates 25g; dietary fiber 12g; sugars 7g; protein 9g I just love preparing my breakfast the night before. It makes life so much easier. What activities do you have planned for today? Kevin and I are going to make chicken teriyaki sushi tonight for dinner. Pretty excited about it!